1980's Golden Eagle Super 630 was the end of the fantasy roads line from TYCO. Though the '80s would see such imaginery creations as 'The A-Team' and 'Rambo' sets, the fantasy road empire concludes with the gold-and-blue Golden Eagle. Collectors should note that both the Golden Eagle and Silver Streak diesel seem to have been offered without handrails. From my experience neither has been found new-in-the-box with a handrail set included. 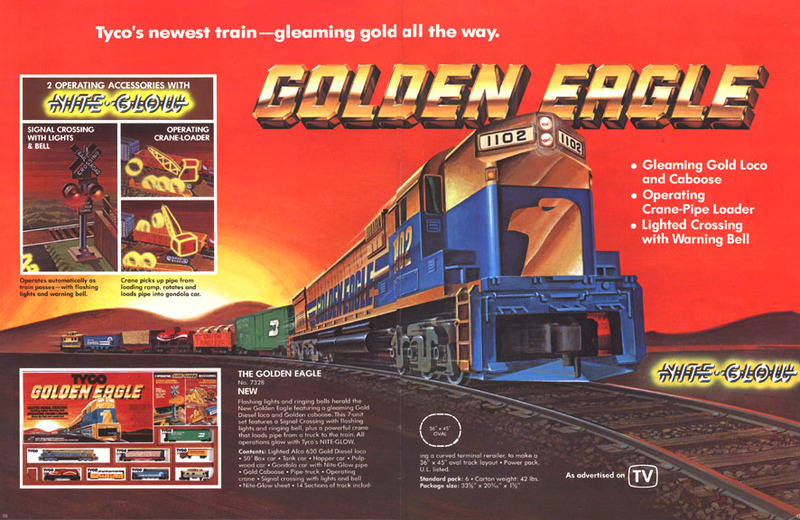 The Golden Eagle was pretty much an endangered species, as it has only one appearance in TYCO catalog history in the 1980 edition.